Cancer is currently a major public health problem worldwide. Recent data estimates that approximately 40 % of men and women will develop some form of cancer, at some point during their lifetime. Major challenges in treating cancer include delayed diagnosis, emergence of resistance toward existing drugs and metastasis, etc. In majority of advance-stage cancers, the conventional therapies are mostly ineffective. Targeted therapies raise new hope in several difficult-to-treat cases, but their application is restricted by variable efficacies of these drugs in different cancers (tissue backgrounds) and genetic backgrounds. Efflux of drugs, inactivation of drugs, modification of drug targets, inhibition of cell death, induction of epithelial–mesenchymal transition (EMT), and enhanced DNA damage repair activity are the most common mechanisms of drug resistance in cancer. 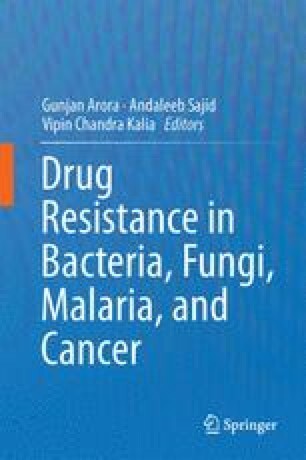 Here, we present an account of these drug resistance mechanisms in cancer and recent breakthroughs in drug development, which have been successful in deceiving most of these mechanisms of drug resistance. Additionally, prognostic biomarkers and approaches for diagnosis of drug resistance have also been discussed. The authors wish to thank the Vice Chancellor, Kumaun University, Nainital, and University Grant Commission [UGC-BSR-Research startup grant, Letter No. F.30-74/2014(BSR)], Government of India, for providing necessary facilities and funds.